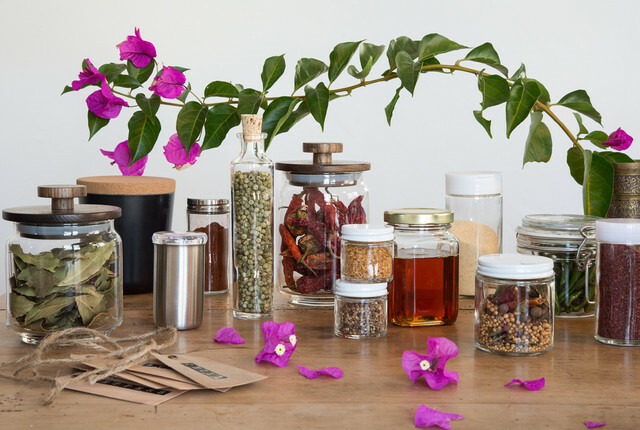 Keep spices fresh and flavorful by storing them in our Stainless Spice Bottle. The bright stainless steel will not tarnish or affect the flavor of your seasonings. The clear acrylic lid features a gasket for an airtight seal helps and makes it easy to keep track of how much is left in the container. How many ounces does this jar hold and what is the measurement of height and diameter? Our Stainless Steel Spice Jar has a 4.33 ounce capacity and measures 1-3/4&quot; diam. x 3-1/4&quot; high. Do these jars fit in the spice rack Tower the ones that swivel? No- these spice jars are too large to fit in our Chrome Spinning Spice Rack. For best results, we recommend hand washing our Stainless Steel Spice Jar with Acrylic Lid. Can these jars be stacked? No, our Stainless Steel Spice Jar is not stackable. Do these spice jars have a sifter? I only want to buy the stainless steel jars. I do not want the funnel. May I order the stainless steel jars alone? What is the part number and cost? The jars (item # 10050824) and funnel (item # 667090) are sold separately and you can find the price on the lower-right side of the product page.